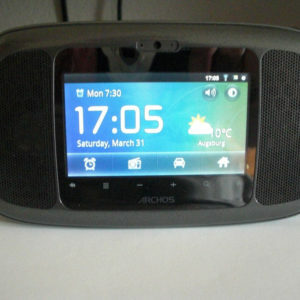 A clock radio with Android? Yes – this is available since the end of 2011 with the “Archos 35 Home Connect”. With the advent of MP3 as a space saving format for digital audio data in the 1990ies, also devices were developed for it. The first devices like the MPMan F10 or the RIO PMP300 did not provide an internet connection and were only able to play back music which was stored on the device itself. With the increasing distribution of DSL connections and affordable flat rates this became interesting for play black of live programmes as MP3 stream. 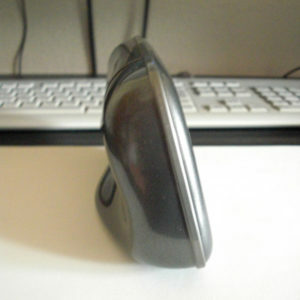 A new kind of devices appeared – internet radios, sometimes called “web radio”, since many people use “web” as a synonym for “internet”. 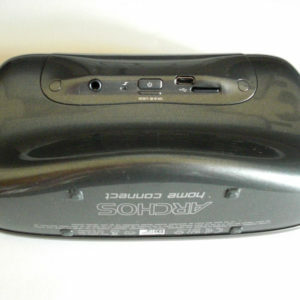 Well known examples for this category of devices are the Noxon iRadio or the Logitech Squeezebox. Up to now those devices were mostly a “black box” with a proprietary firmware of the particular manufacturer. But with Android an interesting opportunity was created: You can combine quite cheap hardware with a freely available operating system and software from a huge collection. 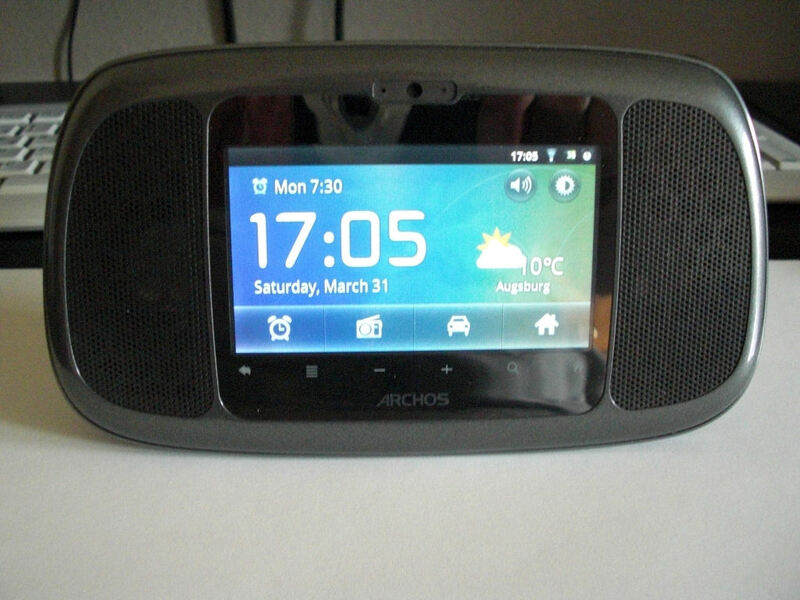 Since Android already provides internet access, WLAN and audio playback, the step to use it for an internet radio is quite obvious – and this is exactly, what Archos did with the Archos 35 Home Connect. The addition “35” in the name comes from the slant of the display – 3.5 inch. The official recommended retail price is 129 EUR at the moment (as of March 212) and you get the device already for 100 EUR. The touch screen – neither the low resolution of 480*272 pixels nor the resistive technology are really convincing. Multi touch gestures are not possible technically and swipe gestures are difficult, since you have to press the display quite hard. Additionally the navigation keys are not illuminated and in a dark environment you may have problems to hit them exactly. “Real” keys for the volume control are also missing. Unfortunately you really note that this device was basically developed to be cheap. 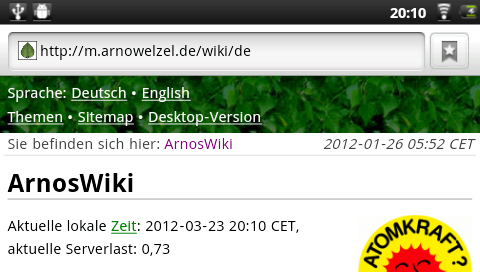 The remote control using the smartphone application from Archos is also nearly unuseable and often lost the connection during a test. The battery – a battery which is not exchangeable is not comprehensible for a device of this kind. Presumbly this is also a concession to the low price, as a battery compartment with a removable cover would have cost a bit more. At least the stated run time of about 4 hours can be achieved practically and if needed the device also runs in standby mode and activated alarm clock over night with one battery charge. 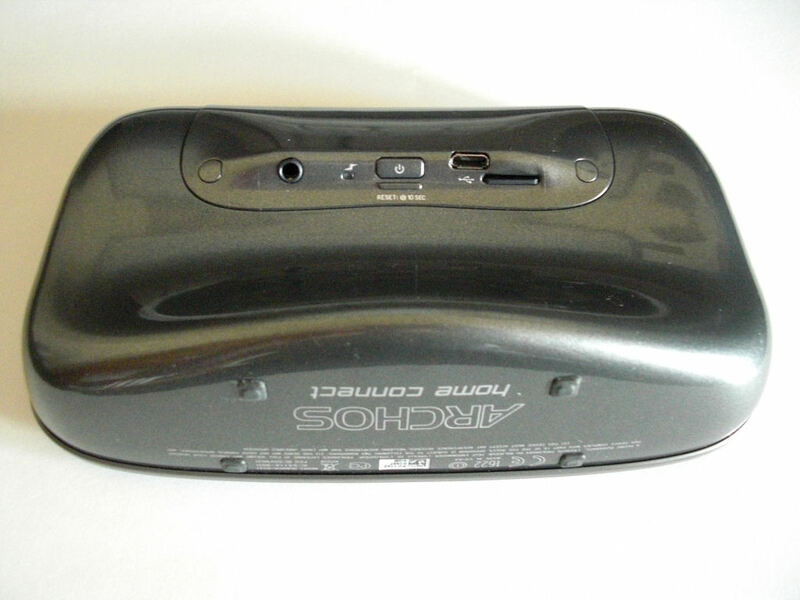 The camera – it only provides VGA resolution (640*480) and takes barely useable pictures through the tiny lense. Although Archos advertises the devices with the possibility of using the camera and microphone for video telephony or as a baby phone – there is no software provided for this. There is an application to take pictures and videos, but even simple smartphones provide better pictures. So the camera is more a dispensable gimmick. 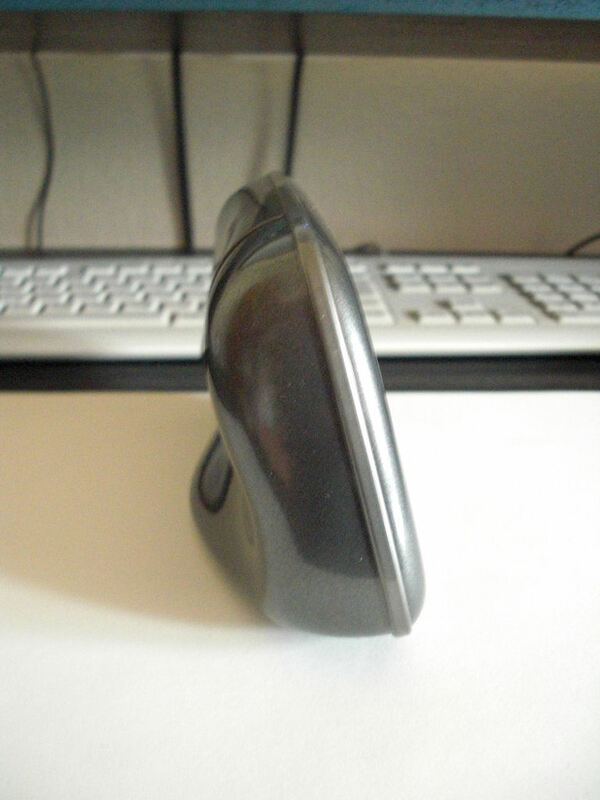 Despite all shortcomings the device achieves its main purpose quite well. The sound of the speakers is, compared to their size, surprisingly good – sufficient bass and also without annoying distortions or clanks at maximum volume. If this is not enough, you can use the jack on the rear to connect head phones or a separate amplifier. The speakers will then be turned off automatically. With 4 GB internal memory ther is enough space available for music – and if this is not enough, you can expand the memory easily with a MicroSD card. 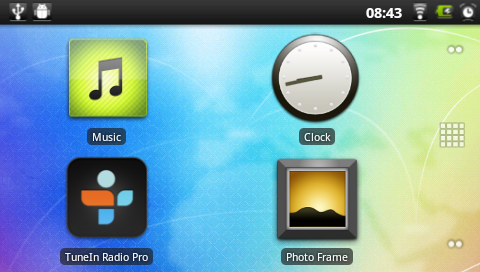 The home screen shows the most important applications as large symbols: Music, clock, internet radio and a picture viewer. Due to their size, the symbols can be touched very easy and the response time is also very low thanks to the fast CPU. As usual for Android there are additional screens available (here five in total) which you can customise using additional shortcuts to applications or widgets. Fortunately you can move to the different screens using the symbols on the right side of the display, so you don’t need swipe gestures which do not work well using your finger tips on the resistive touch screen. The time will automatically be set using time servers in the net and you can set different alarm times for different days of the week. Also the alarm sound is customisable and may also be your own music. Besides the current time also weather data is shown and from the clock you have direct access to the radio, traffic information using Google Maps and the home screen. If there is an external power supply connected, the display changes to a kind of “night mode” after a couple of minutes, with green numbers and a dark background – also when the radio is active. In battery operation the display turns off completely instead (until the alarm clock rings). 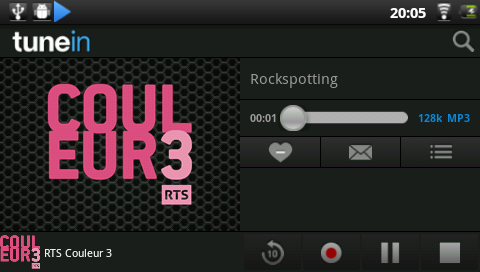 The provided software for the use as internet radio works quite well: TuneIn Pro. The current programme can be recorded at any time and up to 30 minutes will be buffered, so you can pause the play back any time and continue at the same position later. There is also an alarm clock and a “sleep timer” which turns off the play back after 10 to 120 minutes. The provided music player is also felicitous. 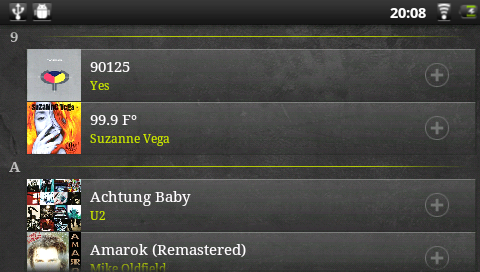 You can select songs by artist or album or from the list of existing files. Besides MP3 also FLAC, OGG and WAV will be supported. It is also possible to access UPnP servers (for example Mediatomb) or network shares on another computer via CIFS. Additionally there is also an application to play back videos – but the small display is not really suitable for longer movies. If you look for something to watch movies while travelling, a tablet or netbook is probably the better choice. The usual web browser of Android including support for Flash is also available but barely useable due to the limited resolution and the resistive touch screen. 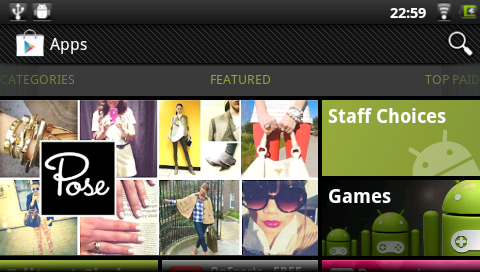 There is also an Android version of YouTube – if you need it. 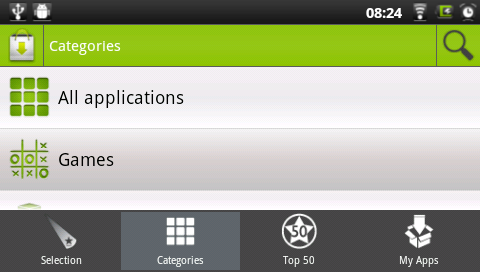 I had a quick look at the remaining applications but did not use them further. 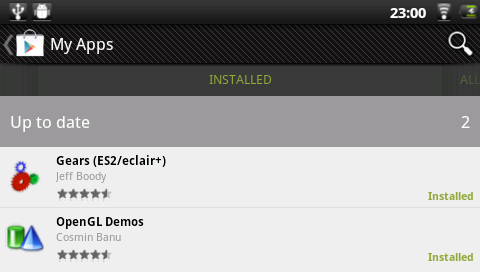 Instead of Android Market which was meanwhile merged into the “Google Play Store” Archos provides its own market “AppsLib”. 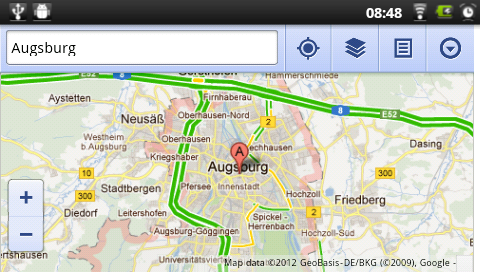 If you prefer to use Google Play you can achieve this using “ArcTools” which can also be found in “AppsLib”. The installation is quite unspectacular and after restarting the device Google Play is available without any limitations. The login which i have already used on an HTC Wildfire S was accepted without any problem. But you have to accept that many applications are not available due to the old Android version and the low display resolution. 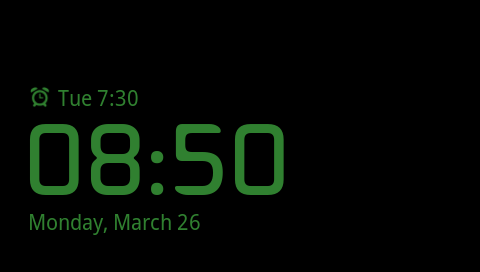 One effect which i have noticed after the installation of Google Play and the Google applications: The weather display of the clock was not useable any longer, so i had to reset the system with factory settings – there was no other way to remove the modifications by “ArcTools” completely. 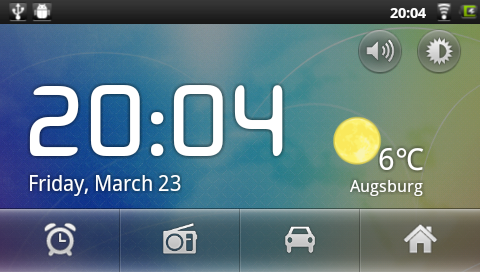 Update: With the current version of ArcTools the weather display still works after installing Google Play. The Android Debug Bridge (ADB) is also useable with the Archos 35 Home Connect – and therefore it is also possible to develop and test your own applications with Eclipse (the screenshots in this article were created this way). Archos provides instructions for the installation of the driver and downloads at http://www.archos.com/support/support_tech/updates_adb.html. All in all the Archos 35 Home Connect leaves an ambivalent impression. On one hand Android provides a very flexible system which can be extended nearly without any limits and also gives you the possibility to develop your own applications – on the other hand the handling is really worse as it could be due to the resistive touch screen and the low resolution. If there was a capactive touch screen and an exchangeable battery I would recommend it absolutely – but so I have to admit you have to accept a considerable compromise.